Grazing Indian style – the Thali at Ali baba. For some years now smart New Yonkers have extolled the virtues of “grazing” -dining on a selection of starters rather than going for the traditional format of several courses. 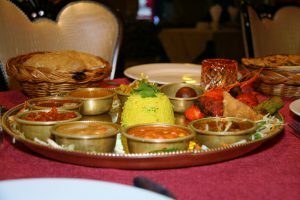 It’s a really great idea if you want to try a selection of tasty bites and an excellent idea for first timers to an Indian restaurant as it gives diners the chance to sample various dishes. I was curious to do a little Indian grazing myself at Ali Baba as they have an amazing and varied selection of starters: Bhajis, Samosas, Pakoras – deep fried battered Paneer (cheese), Chicken or Vegetables, Prawn Puri and Butterfly etc. etc. However, at the end of their really extensive menu I spotted “The Thali A Meal for One” and realised that Alibaba had already done it all for me. This was exactly what I was after an assortment of Indian cuisine served with small portions to try. If you’re in a rush, ordering lots of dishes takes time, so instead this is a great and easy way to sample many different options. You can choose from Vegetarian or Non Vegetarian and with a basket of bread and a delicious dessert is so plentiful and filling it could easily be a shared dish for the budget conscious. Really amazing value with a great glass of house wine at only 100 baht this would also make a quick and excellent lunch choice. The SHAKARITHALI (Vegetarian Thali) is only 590 baht and includes Vegetable Samosa, Onion bhaji, Papadoms, Paneer (cheese) Tikka, Tandoori Curry made from Capsicum peppers, 2 types of Daal – Peli and Makhini. Also an assortment of curried vegetables such Aloo Jeera (spicey cubed potatoes) Kadhai Mushrooms and Onion Kulcha.. The MASAHARITHALI (Non Vegetarian) is 675 baht and also includes Lamb Tikka, Prawn Korma , Rogan Josh Butter Chicken and delicious chicken tandoori and King prawns beautifully blackened just sufficiently to give a really delightful crunch but not to taste too burned – superb! It really is a jewel of a meal and something you can try any time to get a superb taster of the great traditional Indian food from Alibaba.